Dublin-born soprano Sarah Power is a graduate of the DIT Conservatory, Dublin, the RNCM, Manchester, the Guildhall Opera Course and the National Opera Studio in London. In 2014 she was the John Mather Charitable Trust Emerging Artist for Scottish Opera. Awards include the London Bach Singers Prize, second prize in the prestigious Kathleen Ferrier Awards at the Wigmore Hall in London, a Making Music Philip & Dorothy Green Award, an MBF Sybil Tutton Award, a Maisie Lewis Award and the Royal Dublin Society €10,000 Bursary. Sarah was a finalist in the Handel Singing Competition, the Nadia and Lili Boulanger Competition in Paris, the Stuart Burrows Voice Competition and the Royal Overseas League. She is a Yeoman of The Worshipful Company of Musicians and studies with singing teacher Susan McCulloch. Sarah enjoys a busy international career on both the opera and concert stage. 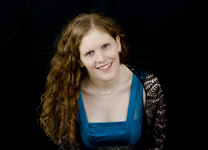 Recent performances include Belinda in Scottish Opera Connect's production of Dido and Aeneas, the title role in a newly-devised work entitled Hazel: Made in Belfast at the Carnegie Hall, New York, the role of Mary in the world premiere of Mary Gordon with the RTÉ National Symphony Orchestra at the National Concert Hall, Dublin, Handel’s Messiah with the Exeter Philharmonic Choir, the Harrogate Choral Society and the Dundee Choral Union and Haydn’s Creation with the Yorkshire Philharmonic Choir. Sarah has appeared in productions for Welsh National Opera, Wexford Festival Opera, Buxton Festival and Diva Opera amongst others. She performed for world-renowned tenor Placido Domingo when he was awarded the Freedom of the City of London and in 2015 she was one of the soloists in Canadian artist Janice Kerbel’s Turner Prize-nominated work ‘DOUG’ at The Tramway in Glasgow. She is also a keen recitalist and has appeared at prestigious recital venues including the Wigmore Hall and St. Martin-in-the-Fields, London, the National Concert Hall, Dublin, Haus der Musik, Vienna and concert halls in Italy, France, Greece and Switzerland. Future engagements include Handel's Messiah with the Irish Baroque Orchestra, Rossini's Stabat Mater with the Yorkshire Philharmonic Choir and recitals with Austrian duo Andrea Linsbauer (piano) and Astrid Groher (flute) in Vienna and Dublin.